Brandon and Shelby: Wildflowers and Whimsy! Haha I woke up this morning and saw that I had 100 followers! Wahoo! Through out this week I was thinking if I get a 100 followers I am going to do a giveaway to thank all you awesome followers! So it will be coming soon, so look for it! Also, i told Brandon if we get a 100 followers we were going to go on a '100' date go buy ice cream with 100 pennies, take a 100 pictures or go out to eat and we can only chew 100 times. haha... we'll see..
Now onto our awesome guest post, and here she is! Hi! 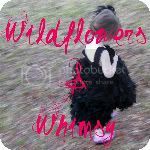 I'm April from Wildflowers & Whimsy! I am so excited to be swapping with Shelby today! So, a little bit about me....I am a wife and mommy to two sweet little boys and one very outspoken little girl...all 4 years and under. I plan on homeschooling, but since they aren't of school age yet, I spend a lot of time sewing and crafting, and they spend a lot of time, ehem, "helping". Which basically means they pulled the thread out of my sewing maching when I wasn't looking or like the time I left my scissors out by accident and Sophie cut up part of a dress I was working on...seriously, I was out of the room for two minutes! How do they get into these things so quickly?!? This is my oldest. He's a sweetie pie. This is my latest design, and I will be giving one away on Sunday as part of the Spring Fling ~ 14 Days of Fabulous Giveaways going on now through April 2. You can check out my blog each day for a link to two new giveaways, and you can check out this post to get a sneak peak of all the 29 giveaways. I also do a lot of sewing for my local fabric shop, so I try to write reviews of the patterns and include tips on areas where I had trouble. I hope you'll stop by my blog, and I love discovering new blogs, so make sure you leave me a comment so I can hop over and visit your corner of blogland! April's blog is so cute and so inspiration, make sure you stop by. Thanks April for being on my blog today it was fun! Stop it right now.. I can't believe all the things she has done. I'm going to visit her blog right now! Thanks Shelby for the guest post. I love basically everything! And I love that she is going to homeschool bc so I am I and I love that you are cool enough to do a blog swap. Color me green! I guess my last comment did not post which is sad because it was really good. You will just have to use your imagination. I am glad she is going to homeschool bc I am too! and I am just over here in TX DYING at all the cute girl things! Hey shelby!! Yay for 100 followers :) I just changed my blog address thought you would want to know :) its stephzoll.blogspot.com see ya!! love your blog and now her's also.